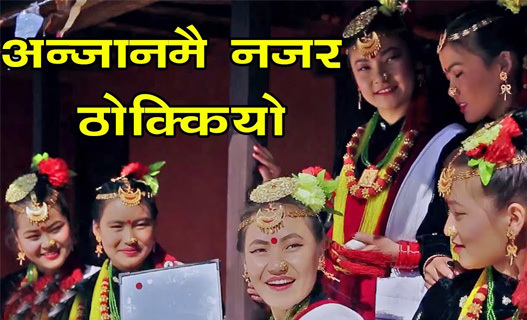 New Nepali Kaura (kauda) Song Video Anjanmai Najar Thokiyo publicly released at Music Nepal's official YouTube channel on This March 5, 2019. Film Director Narayan Rayamajhi, the vocalist of the "Kaura Song" literary and cultural social worker Rimbabu Rana Magar, Compossed music and Lyrics of the song. Tipically Kaura Song reflected in the origin of ancient curiosity in Magar and Gurung community at Nepal . Song was edited by Chhabi Rana Magar at maxon four d. Studio Pokhara Nepal and cinematography of Santosh Pithkote magar. Rim Babu Rana has been directed the song. Video was Produced by Chitreli Prabashi Pariwar, Doha Qatar. Banner : Sanskriti Saraxyan Manch Chitre Syangja.